Trim the top and bottom of zucchini. Using a vegetable corer, hollow out the inside of the zucchini. Trim the top and bottom of onion, core out the bottom of the onion, then make a slice about ⅓ deep into side of the onion, peel off skin. Using your fingers, slowly pop out the onion rings one at a time, only use rings large enough to stuff. Cut top of pepper, take out the seeds and white layer. Set aside the cored out leftover squash, onion and pepper pieces. Dice leftover onion, pepper and squash. Sauté together with garlic until soft and the color has changed, about 5 min. Wash and rinse rice. Combine sautéed vegetables, rice, meat, spices, tomato paste, ½ stock cube and salt. Mix well. Stuff vegetables, take care not to over stuff as rice will expand while cooking. 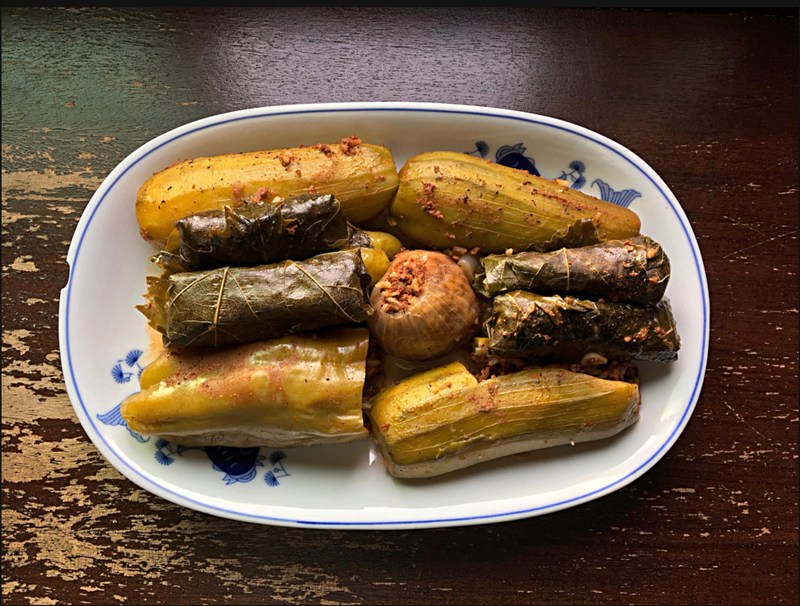 To make vine leaves, flatten out vine leaf, place a spoonful of filling (roughly one tablespoon) in the center, Now, fold from the stem end of the leaf, fold the right and left side of leaf into the center and roll forward as you tuck in the filling. Roll as tight as possible. Dilute remaining stock cube (optional) and ¼ cup of tomato sauce in 3-4 cups of hot water. Place stuffed vegetables on the bottom the pot, place vine leaves on top. Pour in stock until almost covering vegetables. Pour ½ cup of sumac juice over everything. Turn on high heat and bring to boil. Once boiling, adjust to low heat and cook for 45 min. Serve hot.